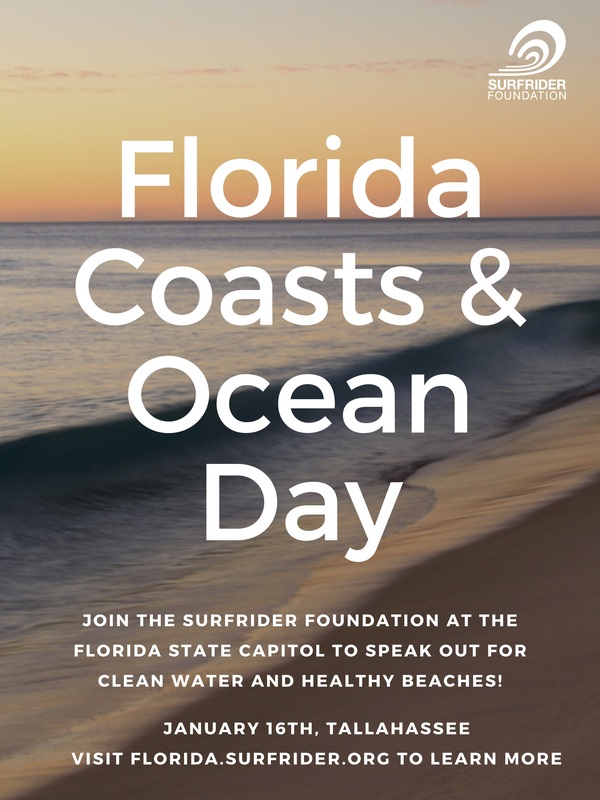 Join the Surfrider Foundation and partner organizations in Tallahassee for our citizen advocacy day on January 16th! This is your opportunity to speak out for clean water and healthy beaches. We’ll be supporting the plastic bag bill, water quality monitoring, and beach access. Don’t worry- we provide training, schedule your meetings and even feed you! Get registered today! *Please note, if you can’t make the training on the 15th, we’ll have a mini-training session and briefing over breakfast on the 16th. LODGING: If you’re looking for lodging, please contact Holly Parker hparker@surfrider.org or 850-567-3393. Local Surfrider Foundation members have opened their homes for those who need a room for January 15th. Also, if you have a hotel room with an extra bed and would be open to sharing a room- please let me know! If you’re not into sharing space, check out hotels.com- there are still a few rooms available in the area. CARPOOLING: If you have room in your vehicle or you’d like to carpool to Tallahassee, please contact Holly Parker at hparker@surfrider.org ASAP. ATTIRE: We recommend business/professional attire for the lobby day. If you’d like, wear something blue so we stand out! Please wear comfy shoes, we will be covering a lot of miles! MEALS: We’ll provide dinner at our training on the 15th and breakfast on the 16th. You’re on your own for lunch that afternoon. There are lots of local restaurants or you can stay within the capitol and visit the cafes located on the 10th floor and lower level. SECURITY: You will have to go through a security screening at the capitol so leave your weapons at home! Please contact Holly Parker if you have any questions/comments/concerns!